From small businesses to big brands, fan girls to sports fans, blogging has put the power of the pen (keyboard) into the hands of every man, women or child with something to say! Whether you’re looking to get a promotion, change career or show off your writing skills blogging can be a great way to make your mark. Before you jump in at the deep-end though be sure to do some research on your target audience. A good way to start is by taking a look at blogs in your industry that are doing it well. Check out the tone and language used as this may differ from sector to sector. Creative industries might be more quirky and informal. Prestigious, status driven industries such as legal professions may be more formal. Getting the tone and feel of your blog right will be an important factor if you’re to use blogging as a vehicle for driving career success! Blogging offers the perfect chance to showcase your expertise and impress would be employers. Be sure to carefully research any blog posts that you write and try to avoid the usual regurgitation that goes on in the blogging world. If you can offer something new and insightful you’ll really whet the appetite of the movers and shakers! Over time you’ll be able to build up a reputation as a credible source of industry information and you may even find that recruiters and employers start to approach you. If you’re looking to escape from your current role into a new area blogging can help you to convince employers that you have the right knowledge for the job even if you don’t have the in-work experience. Communication skills are one of the most essential work skills that you can possess. Having the ability to explain complex ideas in an interesting and understandable way can prove to an employer that you have both the knowledge and the ability to impart that knowledge on others. Having a blog to promote gives you the ideal excuse to network with other industry professionals. Do try to remember though that promotion needs to be a two way street. There’s nothing worse than someone who shouts from the rooftops about their own blog but doesn’t engage with other bloggers. Blogging is primarily a social affair so be sure to talk to other bloggers, comment on their blogs and share their posts that you think are of interest. In addition be sure to add links to your portfolio, LinkedIn profile or social media accounts to make it easy for employers to get in touch once you’ve impressed them with your wonderful blogging! If you’re hoping to move into a communications role, copy writing, journalism or any other role that includes writing having a substantial portfolio will be vital. As well as writing on your own blog, push yourself out there and blog for others. If an employer can see that other organisations have given you the seal of approval, it makes them more likely to do the same! 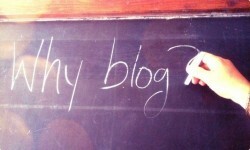 Has blogging helped you to gain a promotion, change career or get into an exciting new job? Have you got any great tips for writing a successful blog? Join the discussion and get involved in the comments below!